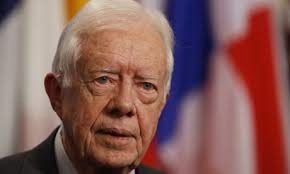 [ SOURCE ] Former President Jimmy Carter is suggesting that President Obama may be reluctant to talk about issues affecting African-Americans because he himself is an African-American. In an interview with The Huffington Post, Carter likened the situation to female lawmakers who are loath to discuss women's issues. "Some women when they are elected become champions of human rights. I've seen other women who are elected who didn't pay any attention to that particular thing because it was kind of an embarrassment to them to single out women since they were a woman - like I think it might be an embarrassment to President Obama to single out African American people." Do you think Pres. Carter is right?